The GS-0017-A, -B, -C, -D toolset consists of the modified drill chuck as well as push pins for all AK, RPK, and AK74 rifles that use diameter 3,0mm dowel pins for the gas block and front sight block, and a diameter 4,0mm pin for the rear sight block. The GS-0017-C, -D, -E, -F toolset consists of the modified drill chuck as well as push pins for Zastava (Yugoslavian) M64, M70, M72, M76 rifles that use diameter 2,5mm dowel pins for the gas block and front sight block, and a diameter 4,0mm pin for the rear sight block. And the GS-0017-A, -B, -C, -D, -E, -F toolset consists of the modified drill chuck as well as push pins for all AK-type rifles of all Countries. Additionally, if the purchaser needs different pin sizes for a specific application – he can obtain them himself from McMaster-Carr et al, or purchase them from me. Please know that these pins are made from fully-hardened M2 high-speed steel and quite difficult to cut. 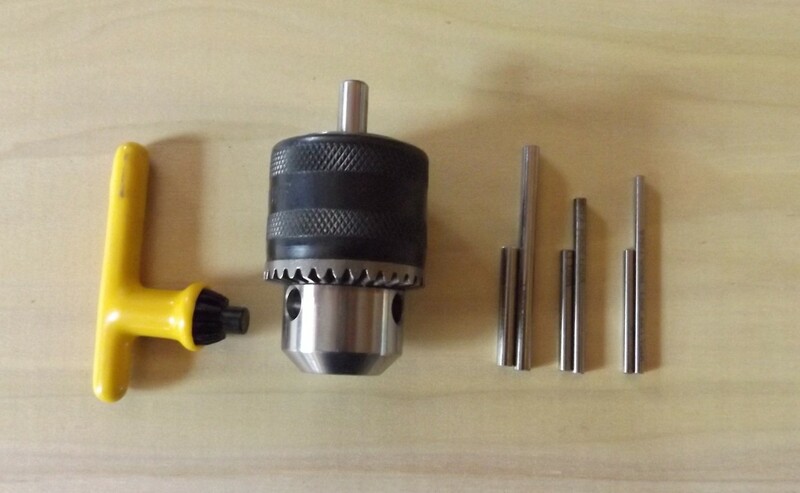 If you purchased a GS-0012 press ram adapter from me, this toolset is designed to work perfectly with it. If you have a press ram adaptor made by someone else; it will work as long as the tooling hole is diameter 0.250″ and 0.50″ deep. If the hole is less than 0.50″ deep it will affect the stability and longevity of the tool and I do not plan to make shanks of short lengths as the tool will be rendered unstable. Notice! The pins used for this tool are make from fully-hardened M2 high-speed steel so it is imperative that safety glasses, goggles, and/or a faceshield is worn while using these tools. It is also imperative that the tool remain straight and not made subject to side loading.